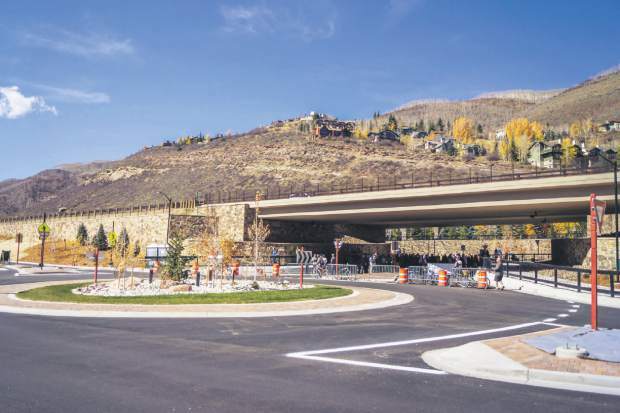 Vail's Sandstone underpass, which links the town's frontage roads between the main Vail and West Vail Interstate 70 interchanges, was recently honored by the American Public Works Association. VAIL — Vail’s Sandstone underpass is the recipient of a national award presented by the American Public Works Association. Details were announced at the Vail Town Council meeting on Tuesday, Sept. 4. The national group announced the award in August at its annual convention, held in Kansas City, Missouri. Nominated by the Colorado Chapter of the American Public Works Association, the Sandstone underpass project was recognized as the 2018 Transportation Project of the Year in the category of small/rural communities. Judges scored the nomination based on cooperative achievement in the management and administration of the project as well as the alliance between multiple agencies, the contractor and the consultant. The Sandstone underpass was completed in October 2017 following 18 months of construction. It was funded by a partnership involving the town and the Colorado Department of Transportation. Extensive participation by representatives from adjoining properties contributed to the success of the project. Recognition was also given to the contractor, Kraemer North America, and the project’s consultant, Felsburg Hot & Ullevig. Vail Town Engineer Tom Kassmel, Construction Inspector Chris Delles and Public Works/Transportation Director Greg Hall were among the representatives who traveled to Kansas City to accept the award on behalf of the town.